“The utter irrelevance of Trump’s one-off bombing of a Syrian airfield hasn’t made the slightest dent in the myth that Obama bombing Syria in 2013 would have changed everything, has it,” Marc Lynch, a George Washington University professor of Middle East studies, wrote on Twitter. Indeed, pressure is mounting for another set of such strikes, and it looks as if Mr. Trump may again carry them out. What Americans may be confronting — whether they want to or not — is the reality that some problems can’t be fixed by the sort of low-cost, low-risk solutions to which they grew accustomed in the brief moment of American global hegemony after the Cold War. It feels impossible that something could be beyond easy American resolution, so the problem must be that the president lacks proper will or resolve to see that resolution through. “For those who want a military response, the question is simple: can you tell me any practical response short of full-fledged invasion that could prevent this?” Emma Ashford, a Cato Institute analyst, asked on Twitter, referring to further chemical attacks. To understand this, it helps to divide possible American responses into three categories, each of which comes up against hard problems that are structural to the Syrian war. Option category #1 could be termed the sort of limited, punitive strikes that Mr. Obama was pressured to execute and that Mr. Trump saw through last year. Such action is meant to impose a modest cost on Mr. Assad or to send a message that future chemical weapons use will not be tolerated. At the same time, it is meant to avoid any risk of changing the course of the war, which could lead in unanticipated directions — like embroiling the United States in a larger conflict, or collapsing the Syrian government, which could, in turn, spread chaos that would risk millions of lives. But past efforts at these kind of strikes have failed for two reasons. First, they do not change Mr. Assad’s calculus because, to Mr. Assad, this war is a matter of personal and national survival. If he believes chemical weapons are necessary to his survival, he will abandon them only in the face of some threat to his survival greater than the benefit he thinks they offer him. That requires an existential threat, which the United States is unwilling to impose because of the risks. Second, Mr. Assad’s Russian and Iranian allies can easily help him absorb the costs imposed by such strikes. If the United States bombs another Syrian runway, Russian contractors can simply pave Mr. Assad a new one. It’s not exactly a game-changer for him. Fuzzier arguments for limited strikes — that they will communicate American resolve and toughness — play well in domestic politics, but there is little concrete evidence that such messages make much difference to adversaries. Option category #2 might describe the policies that Mr. Obama favored: actions that make the war costlier for Mr. Assad — arming anti-government rebels, for instance — so as to pressure the Syrian leader into complying with American demands. Some analysts argue that the “Assad tamers” were so successful that they prompted Russia’s 2015 intervention in Syria. In that sense, Mr. Obama’s approach not only failed, it backfired terribly. The result was a bloodier war with more Syrian suffering but little change in Mr. Assad’s calculus. Further such escalations would risk the same. 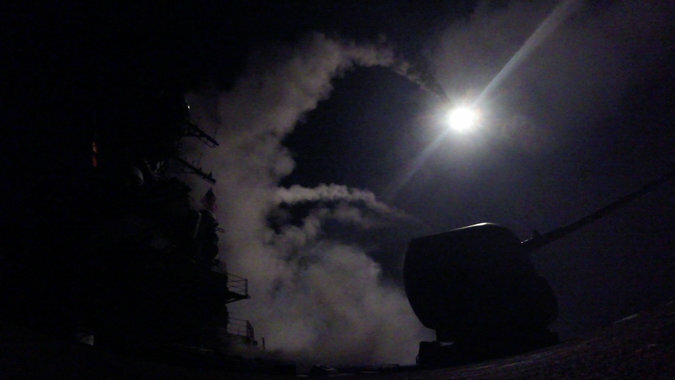 Option category #3 would be attacks that go beyond what the Russians and Iranians can match, which is likely to mean either a full intervention or strikes that existentially threaten the Syrian government. These strikes would only be enough to work if they deliberately create one of two risks that the United States has strained to avoid. The first risk is that of collapsing the Syrian government, which would exacerbate Syrian suffering by throwing millions more lives into chaos and most likely prolong the war. The second risk is of a direct military confrontation with Russia, a nuclear-armed power with the ability to escalate hostilities rapidly in the Middle East and Eastern Europe, putting millions of non-Syrians at risk. “Bottom line: Assad’s actions are abhorrent, but there is no practical military option here unless you are willing to effectively collapse the Syrian state and re-escalate the civil war,” Ms. Ashford wrote. Mr. Trump, she predicted, would launch another set of punitive strikes that would “change nothing” but win domestic approval. But why does such support still exist for a policy that has already demonstrably failed? Research by Sarah Kreps and Sarah Maxey, political scientists at Cornell University and the University of Pennsylvania, found that Americans feel a moral obligation to help humanitarian victims — and to provide that help in the form of military action. This can lead Americans to support seemingly incongruous policies like saving war refugees by dropping bombs. But it’s not just voters. Within Washington, an odd revisionism has arisen around Mr. Trump’s previous set of strikes, meant to explain why they produced little tangible benefit. They only appeared to fail because the United States, it is said, did not properly capitalize on the “leverage” the strikes had provided. There is an alternate hypothesis: The reason that limited strikes rarely seem to translate into “leverage” is because they do not produce “leverage,” a fuzzy term with no fixed meaning. This is where we think this debate starts to reveal more about the United States, and particularly Washington’s foreign policy community, than about the Syrian war. The cult of “limited strikes” is so powerful in Washington that, even when they do occur, it’s said they were never properly capitalized on. There is always the shimmering hope, just over the next hill, that bombing a runway will make all of Washington’s dreams come true. It sometimes seems as if the United States will be bombing empty runways until the end of time, dead certain that it’s a way to get everything Americans want at no real cost or risk, and that all the past failures only prove that the next time it’ll work for sure.